When your child starts primary school, moves up to secondary school, or switches school mid-year, it heralds a big change in their life and any help you can give in helping to smooth the transition will be very beneficial. This is particularly true with the transition to a new kind of school - it will often bring a complete change of routine, as well as potentially more homework, longer hours, a whole new bunch of students and teachers; even things like a different journey can be very disruptive to a young child’s life. Here are some tips to smooth out the process and help your child to settle into a new school regime. Kids tend to thrive off routine or at least the feeling that they can they know what is ahead, so start helping them get ready for school a while before it starts. Set the alarm for “school time”, help your child get his school bag ready, talk about lunch options if necessary, and practise the route to school if she or he is setting off alone. Ask the school for a copy of your child’s timetable if appropriate, to help him or her know what to expect and so you can help to pack the correct equipment (like sports kit or calculator etc) every day. Once your child is in the school building it is best not to interfere too much (except if there is a serious situation that requires intervention, like bullying), but you can help your child to settle into new friendships by encouraging them to be social. Talk to your child about the people he or she is meeting, and if your child is younger, arrange play dates with other children at the school before the start of term. This will help your child feel more comfortable about the start of term, since he or she will already have met some of the new classmates. Understand that your child may feel unusually tired, grumpy or argumentative after school in the first week or two - he or she will have a lot to cope with, and may take it out on you as parents. 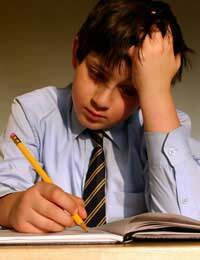 After school, your child may face homework for the first time, or have more than in previous years. What they will have to tackle will depends on the age, subject, and school, but you can help by providing a quiet space with all the necessary paper and pens. Encourage your child to view homework as part of their daily routine, doing it every day rather than letting it all pile up just before it is due. Don’t be too concerned if settling in is taking longer than you anticipated, starting a new school is a huge transition for a child, and there will inevitably be bumps in the road to face. But if your child seems to be unduly upset, has not made any friends after a considerable effort and period of time, is struggling with work or has any other serious complaints, then seek help from the school. Whatever the problem, the school is bound to have heard about similar issues before, and the school pastoral officer, class teacher or head teacher will be able to help you and your child to improve the situation.